Commonly called picotee sky flower, Duranta erecta "Sapphire Showers" livens gardens within U.S. Department of Agriculture plant hardiness zones 8b to 11 with its frilly, purple and white flowers, which bloom from late spring into summer. Established picotee sky flower suffers few serious problems and will thrive with minimal attention. However, routine care and maintenance will help it look its best and ensure a long, productive life in the garden. The fruits and foliage of the plant are considered poisonous. 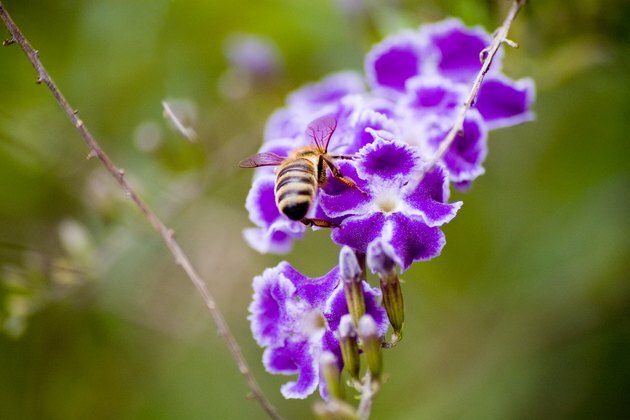 Picotee sky flower attracts pollinating insects such as bees. Picotee sky flower is a soft grower, meaning it wilts easily without regular watering during hot, dry weather. Established plants need deep, frequent watering from spring until autumn, but the soil must be allowed to dry out on the surface between waterings to prevent root problems. Pot-grown picotee sky flowers may need more frequent watering due to their limited root system. Monitor the plants closely and water whenever the soil surface dries out, adding water until it trickles freely from the pot's drainage holes. Reduce watering in autumn and winter, providing only enough moisture to keep the foliage from wilting. Picotee sky flower is a heavy feeder, especially under high-light conditions. It needs weekly fertilizer applications from spring until autumn to support its vigorous growth, although its needs may increase to twice weekly if it develops yellow foliage or if its growth slows significantly. Dissolve 1/2 teaspoon of general purpose, 15-15-15 fertilizer or blooming, 7-9-5 ratio fertilizer in 1 gallon of water. Apply the solution to moist soil to prevent root burn. Picotee sky flower needs a rest period during the cooler months, so withhold all fertilizer from late autumn until early spring. Despite its more compact growth habit, picotee sky flower needs regular hard pruning to keep it tidy and attractive. Prune in summer after the flowers have faded, removing up to half of the plant's stem growth with sharp, clean pruning shears. Picotee sky flower also benefits from light selective pruning throughout the year to remove unwanted, dead or discolored growth. Before pruning, soak the pruning shears in a sanitizing solution of undiluted household disinfectant or 1 part bleach and 3 parts water for five minutes. Rinse the blades well and wipe them dry before use. Serious pest problems are rare in picotee sky flower, but they sometimes attract minor infestations of whiteflies and aphids. Both whiteflies and aphids feed on plant sap, creating small wounds in the stems and leaves that often result in yellow, dropped foliage. Treat both types of insects with insecticidal soap. Make a 2-percent solution by mixing 5 tablespoons of insecticidal soap with 1 gallon of water. Apply the solution with a spray bottle every four to seven days, using shorter intervals for more serious infestations and longer intervals for minor problems. Saturate the affected areas, then rinse off the residue roughly two hours after each application to prevent foliage damage.